Also I'm really not sure why people seem so against its restoration being funded from somewhere outside of the Catholic church? It's been a primary icon of Paris and France for hundreds of years, it's a massive tourist draw, and it's just the right kind of place to catch some rich person's favor and get special treatment. Maybe it's because there aren't comparable places in the US? If the pyramids got smashed up, the wailing wall got hit by a truck, Borobudur was in an earthquake, the Parthenon was in bad shape (oh wait it was and has been fixed with public money) - all ancient places of worship who's meaning and cultural value have transcended that - you'd expect public funding and private investors to come forward to restore and preserve them... just like with religious artifacts in museums, so why would an at least partially public funded restoration be such a sour note for people? It's exactly what I'd expect and is really par for the course for significant, historic, religious buildings of any sort. the catholic church can use it, but it's owned by the state. I think it's of value to all of mankind. Forget about the fact that it is a church. The bible says that were two people gather in the name of God, that's a church. To me the sheer awesomeness of the building is enough for me to be mortified by the damage. If you are looking for a hunk, a stud and an Italian stallion ... you better look someplace else because you won't find any here. Pardon me again with the funny. 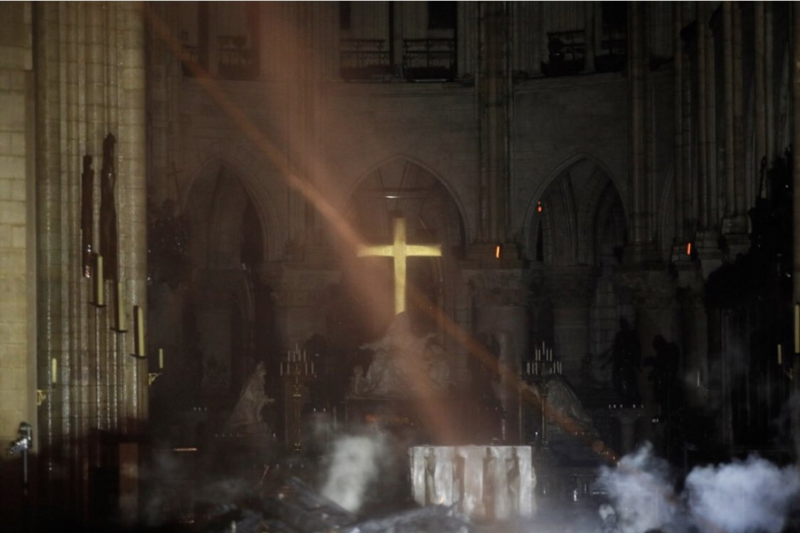 The devastation of the Notre Dame is not funny (it's apocalyptically tragic) ... but this pic unfortunately is. It's a World Heritage Site, and should absolutely be restored to whatever extent is possible, with the world's appreciation to all involved in the effort. Glad to hear that the damage was in some ways not as bad as initially feared. And also glad to hear that some French billionaires (and I hope some other billionaires across the world will later pitch in) already pledged some 400 million dollars for the reperations. That is basically how I feel about it, too. The building is priceless in terms of its architectural and historical value, and that is not even to speak of the works of art held inside that were likely lost. It is also priceless to the people of Paris. The Notre Dame Cathedral is a Paris landmark, literally the center of the city, and a huge source of pride to Parisians, who are probably feeling as devastated as New Yorkers felt when the World Trade Center towers came down. perhaps "some people did something"? Keep the P&R nonsense where it belongs. It's much more than history, but since you see it as a church of an "apostate religion" I'm sure it's impossible for you to believe otherwise. Come to think of it I'm tired of reading your BS replies everywhere. Welcome to the ignore list! this has been making the rounds on reddit today. considering how horrific that inferno looked, it's not too bad. the biggest loss seems to be the roof, which afaik was made from european old-growth hardwood which doesn't exist anymore. the wood in the roof was apparently also very dry, which fed the fire. i remember walking around the roof, to the bells, etc, and thinking "holy **** these beams are massive". kindda makes sense how huge the fire was. In retrospect, a retrofit probably was advised.... but it's tricky piping water up high into old structures, lots of engineering and analysis goes into just trying to figure out whether or not your change will make everything collapse, so they often try to minimize changes to an extreme degree. Looks like, from the video, that the blaze was mostly in the upper levels, which probably explains the massive fireball you could see from the outside and the relatively low damage to a lot of the interior. Sure helps that the walls are stone too in containing the spread of it. i don't think the church wealth is liquid. it also belong to the french state, but the church can use it in perpetuity. salma hayek's husband has pledged 100 million euro, although it will probably cost a billion or two. ... I don't know man. The church, assuming we mean the Catholic church as a whole, could probably sell one of the droves of solid gold "treasures" and art pieces they have to cover the cost of this at the drop of a hat. Not that I mind tons of rich people pouring money in to cover the cost. But the catholic church is hardly damn poor. Notre Dame does not belong to the Catholic Church, it's French State property. Not at all, not exactly common knowledge, valid assumption. A lot of history there not just the cathedral itself, in the crypts below it there is a 2000 year old archaeological site. Cynical me says that the Vatican has a metric ton of metric tons of liquid wealth. They're richer than the Rothchildes. It's a Catholic (ie-Vatican) church, regardless of which municipality claims it. The Vatican should pay for every cent of its restoration; not the people, who already pay more than they should for everything, anyway. His father told the newspaper that his son is a “brilliant” professor and sounded normal on the phone just hours before the incident. “Extremely out of character. He’s a brilliant professor. His writings — other professors can’t even understand his writings. Tell cynical you that the Vatican is not paying for it as they don't own it. They may not own it but it is the seat of the Archbishop, part of the archdiocese, which is part of the church, which is a segment of the Vatican in some way, shape, or form. They are sitting upon billions and billions of dollars in wealth, liquid or not. There is no reason the Vatican can not pay to rebuild Notre Dame .. I’d argue that a good reason for the Vatican to exist at all is to be of use in these types of situations. It is what it is, I’m well aware that the Vatican won’t pay because there are suckers everywhere donating millions of dollars to repair the building; doesn’t change the fact that it does seem odd that we have so many world crisis and issues, yet there is no assistance to those causes. There is an entire organization that could fund the rebuild 10 times over and not blink an eye, yet they won’t raise a finger. Seems odd to me. The Queen actually wanted the people to pay for her castle when it burnt. The Gov had to intervene and make HER pay. Those types of organizations still see regular people as peasants at their service. Snavel fun Fact: Super religious aunt of mine actually went to the vatican. and became atheist. I wish I was joking. There is nothing about the good of the people in the vatican. "THE ROOF THE ROOF THE ROOF IS ON FIRE. WE DON'T NEED NO WATER LET THE MOTHER****ER BURN"